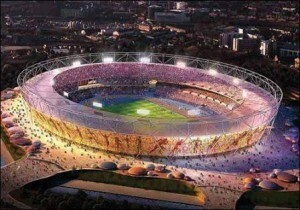 Want to get a look inside the Olympic Stadium, and help an important charity? Eight celebs will lace up their trainers and get on the track to help raise funds for the National Society for the Prevention of Cruelty to Children (NSPCC) in April. The participants, including Celeb Big Brother contestant and ex-Welsh rugby player Gareth Thomas, singer Sinitta and cricketer Alec Stewart, are taking part in an NSPCC Gold Challenge charity celebrity relay at the Olympic Stadium on Sunday 1 April. Gold Challenge is a campaign to raise £20 million for over 100 charities by the end of the Olympic year, encouraging mass participation in UK sport along the way. Go and cheer the participants and celebrities, while you get the chance to view the Olympic Stadium from inside. You can buy tickets for the event now, price £12. And if you fancy something more athletic than simply spectating, put in a bid to take part. The highest bidder gets to enter a team to participate in the NSPCC 4 x 100m relay against a team of 'celebrity all-stars'.